This component of the project will carry out a resource-mapping assessment of solar and wind capacity across 10 PPA member countries. The objective of this component is to enhance the awareness and knowledge of governments, utilities and the private sector about the resource potential for renewable technologies (solar and wind), and to provide governments with a spatial planning framework to guide investment in the RE sector. These resource maps will: (a) provide a detailed assessment for solar and wind and potentially other renewable energy resources in the islands; (b) increase the awareness and knowledge of governments and other energy sector players about renewable energy potential; (c) provide baseline information for potential new public and private sector investment projects; and (d) serve as an input for grid integration studies. Phase 1–Project inception, preliminary modeling, and implementation planning: Project inception and stakeholder engagement; preparation of an initial resource estimate at the country level based on a mesoscale model using satellite and re-analysis data; preliminary validation using existing ground-based data; preparations for the implementation of Phase 2. This phase is being undertaken by the ESMAP project and one of the outputs for this phase (solar maps) has been completed. Phase 2–Ground-based data collection: Implementation of a ground-based measurement campaign using high-quality measurement devices, with real-time data transmission and reporting, for the purpose of validating and improving the mesoscale model and generating reliable benchmarking data. Phase 3–Production of validated wind resource atlas: Preparation of validated resource maps and atlas reports that describe the final outputs, methodology and process, and include provision of the final geographic information system (GIS) data. Phase 1: satellite data-based mesoscale mapping; Phase 2: commissioning of ground-based data collection and assessment; and Phase 3: production of a validated atlas for the RE resource in question and dissemination of commissioned data. In August 2017, the World Bank officially launched solar maps for Pacific Island countries at the PPA Annual Conference in Apia. These maps are available for free via the World Bank’s web-based tool Global Solar Atlas.The Global Solar Atlas was funded by the Energy Sector Management Assistance Program (ESMAP), a multi-donor trust fund administered by the World Bank, and was commissioned in collaboration with the International Finance Corporation (IFC). 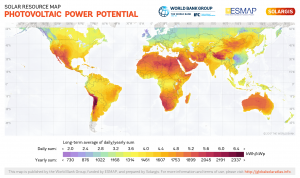 The Global Solar Atlas can be viewed here. The wind maps are expected to be available by the end of 2017. While the data powering the Global Solar Atlas is the most recent and most accurate currently available, it is not fully validated in many developing countries due to the lack of ground-based measurement data from high precision solar radiation sensors. Phase 2 of this component aims to address this through the collection of high quality data from measurement equipment to be installed across the Pacific.